This article submitted by Michael Jacobson on 5/10/00. Students know both sides of the problem. Most likely, they've been the victim of teasing, and they've done some themselves. Students at the Paynesville Area Middle School got a live demonstration of the problem last week when the peer helpers from the high school performed a skit for all three grade levels. Fourteen high school students performed the skit to the seventh graders on Wednesday, to the sixth graders on Thursday, and to the eighth graders on Friday. The skit, which the peer helpers designed and wrote, followed the daily lives of two students. One was a basketball hero, and the other was a quiet student who went unnoticed. While the two students appeared to be quite different, the skit showed that both faced similar problems. From parents being concerned only about turnovers in a basketball game or grades in a certain class, to angry coaches and busy teachers, to students who ignore them, the two main characters struggle to fit in. The basketball player realized that people cared about his performance on the court, but not him. The quiet student received no attention at all. In the end, they are left to wonder: "Why can't they accept me for who I am?" After each 10-minute performance, the high school students discussed the play with middle school students. When asked, the typical response of the students was that they could relate to the characters who had been ignored and to the people who had hurt them with inattention or cruel words. During the discussion with the sixth grade on Thursday, senior Allison Thompson told a group of students that one way to help is to stand up when you see other students being teased and say, "Knock it off." Scott Ingalsbe, a junior, said a less direct approach was to go out of your way to be nice to people, especially if you see them having a hard time. Little things like saying "hi" can have a big impact. "If you don't have something nice to say to somebody," continued Ingalsbe, "you can at least leave them alone." Junior Ryan Flanders stressed the benefits of getting to know poeple. "Everybody has something to offer," he said, "but you never find out what it is unless you talk to them." A goal of the skit was to have the middle school students think about how they treat others. "I'm hoping they got the message, and they're nicer to each other as a result of this," said junior Ginni Lahr. "I think they realized what it's like to be in the other person's place," explained Cheryl Guenther, a senior who played one of the leads in the skit. "As a group, we wanted them to get to know their classmates better and to change what is happening because they're the only ones who can," she added. Bob Cushman, who retired as school counselor a few years ago but helps with some counseling at the high school, came up with the idea to do a skit. From a survey, they found that some of the students' biggest fears were related to teasing and put downs. "It's great to have your circle of friends," Cushman explained. "We all need those, but make it a point to get to know someone else." He remembers his daughter, years ago, becoming friends with a classmate a month before graduation. They had been in the same class for a decade. 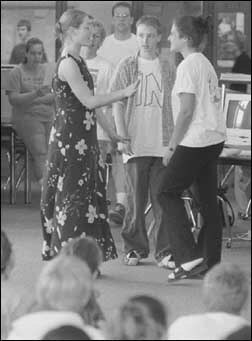 Though the skit focused on fitting in, Cushman hoped it would help prevent peer pressure and possibly chemical abuse by improving self-confidence in students. Middle school principal Deb Gillman said the skit and debriefing were presented very well and were appropriate for the middle school level. She said peer pressure is strong at the middle-school age levels, and individual strengthening is needed to resist it. Gillman hopes the presentation has an effect in the school: that name calling will decrease and students will think twice about how they treat others. She hopes to have a similar presentation for incoming sixth graders next fall, using middle school students as actors. The peer helpers in the high school are advised by school counselor Jackie Campbell. Around 30 students in the high school are involved in the group. The tutors take training in the fall to improve their listening skills and to know when problems need to be reported to an authority. A group of 14 students, including some male students who were recruited to help, made the demonstrations last week. Participating in the skit were: Jessica Andrie, Tina Barney, Laurie Barten, Jen Bruntlett, Ryan Flanders, Cheryl Guenther, Joe Halvorson, Scott Ingalsbe, Kayla Hemingson, Ginni Lahr, Ryan Lang, Susie Swyter, Tony Thielen, and Allison Thompson.